WARSAW (Reuters) - Poland's conservative government accused the media on Saturday of publicising car accidents involving government officials more than in previous years, as Prime Minister Beata Szydlo remained in hospital after a car crash. 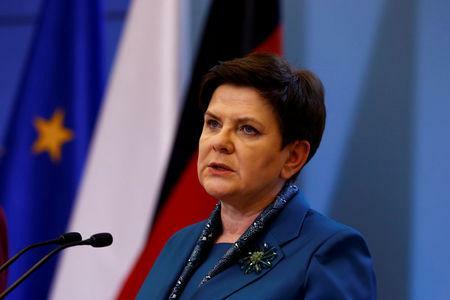 Szydlo was hurt when her car hit a tree in southern Poland on Friday, the third road accident involving a government motorcade since the eurosceptic Law and Justice (PiS) came to power a little bit more than a year ago. "There aren't more accidents involving the Government Protection Bureau officers and cars, they are just more publicised, because different people are in power today and different people publicise them," Deputy Interior Minister Jarosław Zieliński told a press conference. Interior Minister Mariusz Blaszczak said around 25 accidents involving officials with Government Protection Bureau security details had occurred annually since 2013. "These collisions, these things happen and will happen," Blaszczak said. "Somehow I did not hear any comments then," he added, referring to the years before the PiS came to power. "There was no public discussion (in the media)." Critics, however, say that of concern is the fact that Szydlo's accident was the third involving a senior official in a short period time and that collisions are getting more serious. The PiS has been sharply critical of independent media, accusing it of hostile, pro-EU coverage, and it has increased political control over state-subsidised media. Its attempts to curb media access to parliament spurred broad protests in December and led to the worst political stand-off in years. Szydlo's accident raised security concerns given that Defence Minister Antoni Macierewicz was involved in a similar accident last month and President Andrzej Duda had a minor car bump last year. Both escaped injury. Szydlo's motorcade was also involved in a minor collision while on a visit to Israel. Szydlo was in stable condition on Saturday. A government spokesman declined to elaborate but it was believed she would be able to take part in a government meeting on Tuesday.